The pool cover is an essential part of the experience, and something that every owner needs. Let’s talk about the best pool covers around. While safety is paramount, you also want a cover that will maintain the health of your pool as well. When choosing the pool cover that will work best for your home, remember to consider how much storage you have available, how much time you have to open your pool, and the amount of maintenance you can handle for your pool. The lightest and most affordable option on this list is the mesh safety cover. It’s capable of supporting up to 1,000 pounds and works by preventing water from collecting on the top. In the seasons when your pool is closed, the mesh will allow water from rain and snow to seep through the cover and into your pool, but preventing sticks and other debris. Some mesh covers block UV rays while others prevent up to 99 percent of sunlight from reaching your pool and aiding in the growth of algae. Finally, when you’re able to open your pool again, be sure to keep your mesh cover free from debris and other elements that could cause rips. A heavier option than the mesh, solid pool covers create a full barrier between your pool and all environmental elements, including precipitation, the sun, and debris. Unlike mesh, water pools on top of this cover and must be removed from the top with a pool cover pump. This style of cover also requires debris and other elements be removed from the surface in order to maintain its durability. You should also use a brush and mild detergent to clean the cover. Merging the gap between mesh and solid safety covers is the hybrid version. It will give you all of the debris and sun-blocking benefits of a solid cover, but without having to ever pump water from the surface. 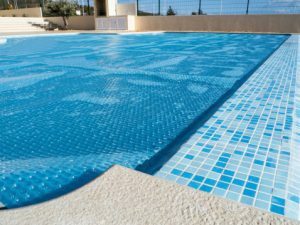 A section of tightly woven mesh in the center allows water to drain through, but the rest of the solid surface will keep out all debris and most UV rays. Once you open your pool, you can wash the cover and fold it up for storage. This entry was posted on Friday, January 12th, 2018 at 11:38 am. Both comments and pings are currently closed.